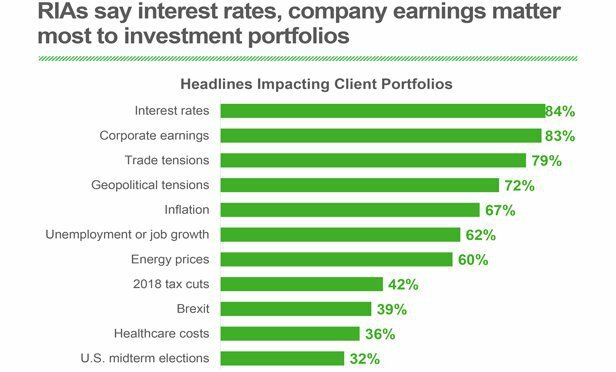 Independent registered investment advisors had a good year in 2018, and look forward to more of the same this year, TD Ameritrade Institutional reported Tuesday in releasing its latest RIA Sentiment Survey. 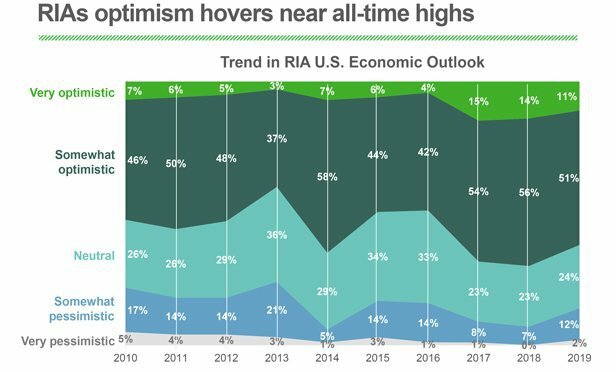 RIAs reported 18% average growth in assets, and more than three-quarters said they expected further asset growth in 2019. Revenues grew by an average 18% in the second half, and new client growth averaged 14% as investors sought guidance amid market volatility. “In times of market uncertainty, investors seek out financial guidance from knowledgeable professionals — independent advisors who focus on their goals, risk tolerance and other details of their financial lives,” Vanessa Oligino, director of business performance solutions at TD Ameritrade Institutional, said in a statement. MaritzCX conducted the survey by telephone between Nov. 27 and Dec. 13 among 302 independent RIAs, both clients of TD Ameritrade Institutional and non-clients. 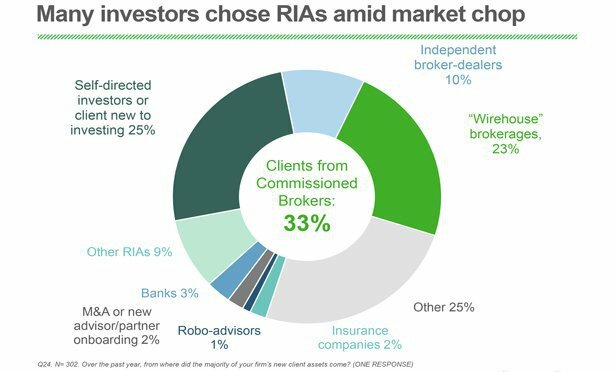 One in four new RIA clients had been self-directed or came fresh to investing, according to the survey. Thirty-three percent of new clients left commission-based platforms in favor of independent, fee-based fiduciary advice. 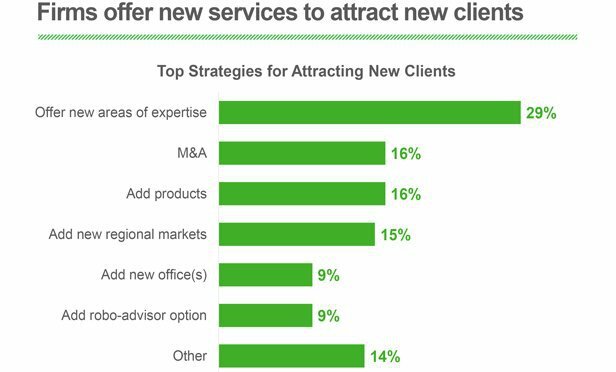 To manage and sustain growth going forward, independent advisors will look to expand their service offerings to meet client demand, potentially through an acquisition. As well, they are most likely to bring on board experienced advisors currently working for other firms, professionals who already have clients and college interns just starting out. Expanded use of digital marketing is also droving growth, complementing traditional approaches and fueling new business development. 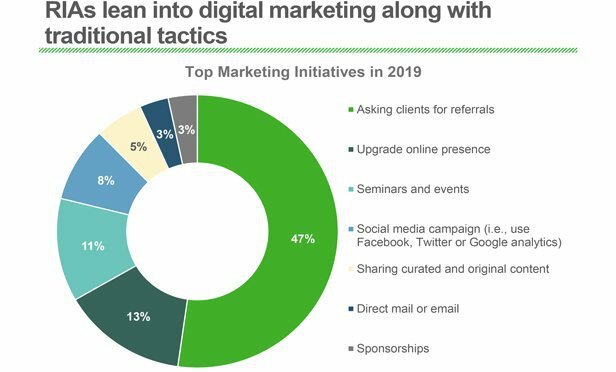 While 47% of RIAs said that asking for client referrals was their chief business development tactic, they were also upgrading their presence online, using social media campaigns and sharing digital content. RIAs in the survey said they expected financial markets to continue helping investors build wealth. Sixty-three percent were optimistic about the U.S. economy, down from 70% in last January’s survey. At the same time, optimism about the global economy has plunged, to 47% from 71% last year. Nearly half of advisors said they expected stock prices to continue to increase, on par with last year’s results. Advisors believed that the healthcare sector would benefit most from the incoming Congress, along with consumer staples, IT and financials. RIAs told pollsters that investors wanted to know more about two sectors that made news in 2018: 55% said clients were interested in environmental, social and government investments and 48% said they asked about cannabis-related stocks. In contrast, only 15% of advisors reported that clients had expressed interest in cryptocurrencies. As for alternative investments, real estate outstripped all sectors. A glance at the headline news tells you what is topmost on investors’ minds these days. Although Brexit stands low on the list of concerns, it is likely to surge with the Jan. 15 parliamentary vote on Prime Minister Theresa May’s deal to leave the EU. At a time when data breaches regularly make headline news, it is not surprising that RIAs say cybersecurity is the most important issue facing the industry and should be a top concern for regulators. 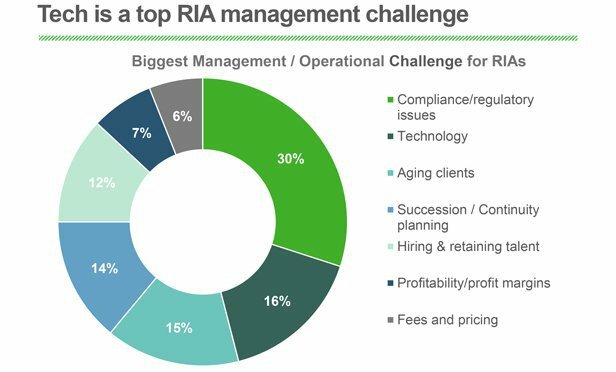 Advisors say technology is second only to compliance issues as their biggest management challenge. It was their biggest operational spend in 2018, and will be again this year, with cybersecurity claiming the biggest part of their technology budgets. 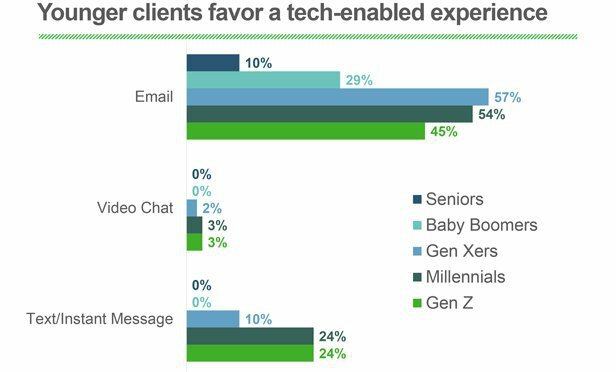 Sdvisors say that email remains the preferred communication channel of Gen X, millennial and Gen Z clients –– though texting and video chat are starting to make in-roads. Baby boomers and seniors prefer the telephone for staying in touch with their advisors, though many are comfortable with email, too. Email is also popular with hackers, underscoring the importance of a vigilant approach to managing data security. “Many data breaches start with compromised email, which is why we encourage RIAs to understand the security risks that come with email, as well as with newer communication channels, and implement processes and procedures to protect their clients and their firms,” Oligino said. Still, advisors appreciate that technology’s benefits can outweigh its risks. Four in 10 said technology had enabled them to connect with more clients than they did three years ago. One in three purported to understand the potential that blockchain technology has for their firm and their clients. However, they remain more skeptical of advanced technology that may appear to replace human interaction.